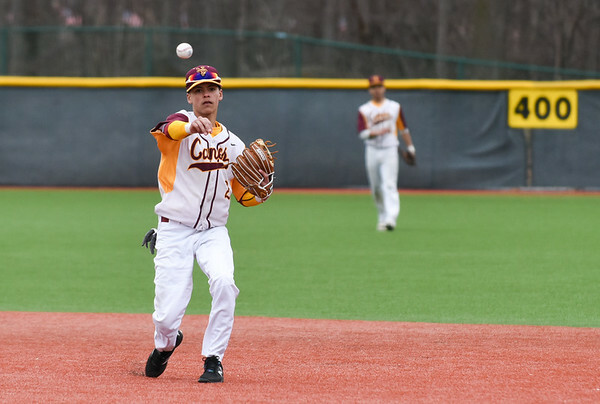 NEW BRITAIN - The New Britain baseball team has a knack for coming through late in games. This time it was Justin Adorno who delivered. Adorno hit the game-winning double in the bottom of the sixth as the Hurricanes held off Newington 2-1 Thursday. Josh Garcia scored the winning run. But it was a pitcher’s duel throughout most of the evening. New Britain’s Will Homar threw a complete seven-inning game and gave up no earned runs. Josh LeClair earned the loss. Plainville 10, Buckeley 0: Jordan Bishop did a little bit of everything for the Blue Devils. Not only did he pick up the win on the mound, he collected three base hits and three RBI at the plate. Plainville’s Nate Mitchalek also had three hits and drove in four runs himself. Bristol Eastern 9, Southington 1: It turned out, one inning made the difference for Southington against Bristol Eastern and not in a good way. Mac Goulet hit a grand slam to drive in four of the Lancers’ seven run in the fourth inning and the Blue Knights went on to lose. Goulet finished his day going 2-for-5 at the plate with five RBI. Jason Krar received the loss for Southington. Goodwin Tech 9, Ellis Tech 4: The Gladiators scored in bunches, using a four-run fifth and three-run seventh to power their way to the win. Tabetha Trammel had two hits and four RBI on the day, including a three-run double in the fifth inning that put Goodwin Tech up for good. Val Ramirez got the win for the Gladiators, giving up no earned runs and struck out five batters. Izzi Kuhn picked up the loss for the Eagles. "Nice win on the road with great pitching, solid defense when needed and timely hitting," head coach Paul Soucy said. Bristol Central 196, New Britain 232: Hurricanes head coach Bob Zadrozny was not pleased with the way his team performed. The Rams’ Jacob Nelson was the medalist of the match after shooting a 47. Jonny Morell was the top scorer for New Britain after shooting a 51. Tim Carrier was next with a 56 and was followed by Arthhur Bell (58) and Dylan Washington (67). Wethersfield 171, Newington 196: It was a tough match for the Indians. The Eagles’ Mike Donnelly was the medalist after shooting a 41. Kevin Russell and Jake Irons tied the low score of the day for Newington. Both shot a 48. Mike Hamill and Brian Turgeon (50 each) rounded out the Indians’ top scorers. Kaynor Tech 241, Goodwin Tech 248: The Gladiators are still looking for a win. Jackson Collin shot a 55 to lead Goodwin Tech, while Josh Donaghy (58), Logan Stine (72) and Farrell Leardi (63) rounded out the top four. Newington 6, Maloney 1: The Indians cruised their way to the win, dropping only the No. 3 singles match. Just one match went to three sets, the No. 4 singles match, where Newington's Abby Molloy picked up the win. In the rest of singles play, Olivia Rozio beat Madison Clansey 6-2, 6-1 and Mara Klin topped Sydney Bednarz 6-4, 6-1. In doubles, Ellie Wronka and Melissa Riggins beat Abby Lespier and Haley Lespier 6-4, 6-2. Lindsay Weaver and Julia Mazur pickedup the win over Tatyana Inman and Rachel Lawlor 6-1, 6-2, while Kelly Iskra and Samantha Miller closed out Sama Patel and Sabrina Vaillancourt 6-1, 6-4. Farmington 5, Southington 2: The match was tightly contested until the Indians beat the Blue Knights in all three doubles matches. Abby Murphy - a 6-2, 6-3 win over Rachel Powell - and Molly Murphy - a 6-3, 6-3 win over Anusha Nagella - pickedup the two victories for Southington. Posted in New Britain Herald, Goodwin Tech, New Britain, Newington, Plainville, Southington on Thursday, 26 April 2018 21:29. Updated: Thursday, 26 April 2018 21:33.